Single license costs $695; Single-server 5-seat network license costs $2695. All of the translation, localization, formatting, and features of DBT Win. Converts NIMAS files into DBT or MegaDots files while automating many steps needed for quality braille production. NimPro reads in the often massive NIMAS or Daisy files containing graphics and text. 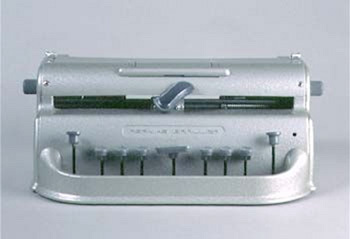 NimPro offers a series of Wizards and Tools to get the text ready for braille production. NimPro saves text in Word, DBT, or MegaDots file formats (in braille volume size chunks, if desired). NimPro is designed to clean up many of the problems found in publisher files. Discontinued product, click here for options for existing customers. SWIFT works with DBT 12.2 and up. SWIFT works with Word 2007 and up. Perky Duck is a free simple braille editor. Perky is a computer-based Perkins brailler emulator. It is used in distance education to demonstrate your understanding of braille. There is one download for Windows, and one download for the Mac.